Let me preface this post: Greta, if you or your children or husband are reading this – look away! And to make sure you get the chance to leave here is a cute photo of my cat, Peanut. Ok, now that that’s over we can move on to business – this Monster quilt. It is both a “monster” because it features cute fuzzy monsters but also because of the monster amount of time and energy put into this thing. I don’t often sew quilts. Ok, I’ve only even finished like, what, 3 in my whole life??? But I saw this pattern (McCalls 6411) in the crafts section of the pattern catalogue at the store and thought “Hey, this would be so cute for my nephews!” They’re all under the age of 7 so a fun monster blanket would be good for them, right? I began this adventure in November of last year and it’s only been, let me count… 1, 2, 3, 4, 5, April – SIX MONTHS!?! I know that intricately pieced quilts take quite a long time but I never imagined that something like this would take forever! I worked on bits and pieces of the quilt every week or so until I’d get tired and frustrated. I had to sew on each felt eye, pupil, tooth, and scale. I had to hand stitch mouths and decorative spots with embroidery thread. I stuffed tails and horns and legs with poly-fill. And then I had to attach each monster to its base (some better than others) and add borders. Finally I had the quilt top finished but it wasn’t until a few days ago that I attempted sandwiching the batting between both layers and quilting. Finally I decided to hand stitch the sides of the quilt closed because I didn’t want any visible seams. I think that was roughly 14 feet of slip stitching! I seriously spent hours non-stop hand sewing. If it wasn’t for listening to audiobooks I would have gone mad! Anyway, I’m glad this monster of a quilt is finished. Next time I’ll try to go the more traditional route sans-fleece (the fleece makes the blanket super warm, though). Although I think I’ve had my fill of quilting for quite awhile now! I’ve sewn with fleece before but never this much at once. Here are some things I learned this go around. Use weights and a rotary cutter to get a precise cut. For smaller bits like monster feet and ears I used scissors as it didn’t matter if things weren’t perfectly square. Have a lint roller handy. The fuzzy fleece shed like crazy on the cut edges and even the blizzard fleece left dust all over. All that fuzz will end up in your machine, too, so be sure to brush out or vacuum inside your sewing machine when you finish. While you could sew through several layers without a walking foot, I highly recommend using one because fleece can get thick! Thank you to my boyfriend’s mom for gifting me one for Christmas last year. I’ve gotten so much use out of it on both quilting and regular sewing projects. Fleece is a knit so use a ball point needle of the appropriate size. 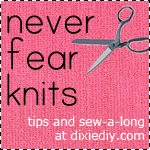 I read that fleece can wear out your needle extra fast. I found this to be the case and had to change needles a few times during the project because the needle would break or skip stitches. Frustrating! I like using a longer stitch length. I think it helps to move the fleece under the foot better. I used a straight stitch for my quilt since the seams don’t need to stretch. There are many types of fleece, some more stretchy than others. For example, the fuzzy fleece that has a pile on one side and a flat side on the other was more stretchy than my thick blizzard fleece. If you use the textured fuzzy fleece with the raised dots, don’t iron it. I expected those dots to be permanent but they were not! Ooops. I found this out when using the crafty-fuse, double sided interfacing to attach the eyes to one monster as you can see in the photo below. If you have more tips to add leave them in the comment section, thanks! I was out of town this weekend for the Easter holiday but now I’m back and I have a bunch of projects to get started on. Exciting! A Time Saving Quilt, plus cat pictures! Previous Article← OWOP Home Stretch!